Steingrímur Gauti Ingólfsson is an Icelandic painter, born in Reykjavík in 1986. He studied Fine Art at The Iceland University of the Arts, Universität der Künste in Berlin and The Reykjavík School of Visual Arts. 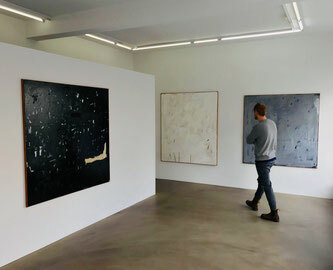 Ingólfsson mostly paints large, sparse, abstract expanses on canvas. His latest works are described as being a sort of an inner conflict, battling over what they want to convey, and what they want to hide. Are they something that we see or something that is hidden; what is surface and what is beneath. Steingrímur lives and works in Reykjavík, Iceland.